A commission piece I just finished. 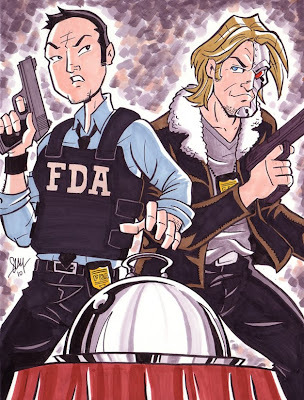 The characters Tony Chu and John Colby from the comic book "Chew" by John Layman and Rob Guillory. 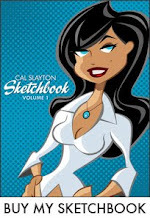 This is one of those great looking books that I haven't had a chance to read yet. And after doing research for this piece, I think I need to pick this bad boy up. Seems like printed greatness. I like how people have posted online who they think should play the characters. I saw a lot of Miles and Sawyer from "Lost", which I have to say I agree with from what I've seen of these characters. I showed this drawing to my lovely wife and asked her who she thought should play these characters and that's exactly who she said. Anyway, I digress. I hope I did them justice even though I wasn't super familiar with them. Apologies to Layman and Guillory if I missed the mark. Niiiice! Looks badass to me! Well, there you go, straight from the artist's mouth! Thanks man, I appreciate it.